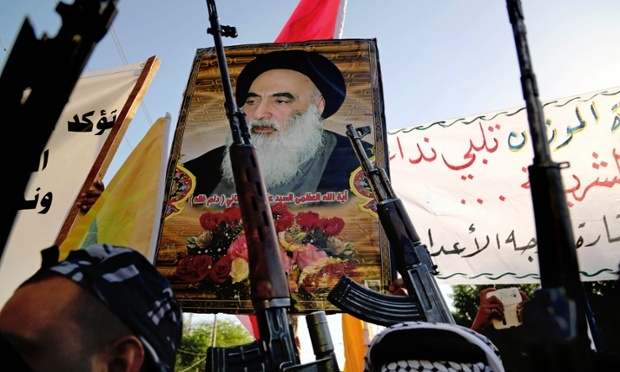 JNN 17 Feb 2015 Najaf : The most powerful leader of Shias in Iraq, Ayatollah Sayed Ali Al-Sistani has issued a powerful statement to the Shia resistance volunteer fighters in Iraq, reminding them of their obligations towards justice. Ayatollah Sistani is followed by millions of Shia Muslims across the world and is responsible for reigning in sectarian bloodshed in Iraq in the past decade. Be attentive to the sanctity of the human souls! Never should you do to them something which God has not deemed permissible. Be attentive to the sanctity of the lives of those who do not fight: the weak, children, women. Even if families of those who fight you. Do not condemn others to heresy. Do not accuse them of blasphemy which could then lead to their death. Do not imitate the Kharijites. Never inflict harm on non-Muslims, regardless of their religion and sect. The non-Muslims are under the protection of the Muslims. In fact the Muslim must protect his non-Muslim neighbours in the same manner and vigour as he would when he protects his own family. Do not steal the money of others. Those who steal from others will find themselves seated in the flames of the fires of hell. Do not disrespect the corpse of the dead, and if you defeat the men of your enemies do not violate the sanctity of their women and houses. Do not enter their [defeated enemies] homes. Don’t take anything from their houses. Take only what you find in their military encampments. Do not verbally abuse their women. Do not insult their honour, even if your enemies abuse your women and insult your honour. Do not deprive any people, who do not fight you, of their rights. Know that most of those who fight you are victims who have been led astray by others. Let your righteous actions, your just conduct, and your sound admonition, serve as an example for them. Do not resort to oppression. Corruption can only be cured by justice. “ It may be the case that when you adhere to good conduct & discipline you suffer losses. This, nevertheless, is more spiritually rewarding. Be the guardians and admonishers of those who accept you, so that in the end they will support you against your enemies. Help the weak among them however you can. They are your brothers & your family. Show compassion towards them like you do with your own. Do not let anything take precedence over your obligatory prayers. Prayer is the means through which man humbles himself before God. Remember God at all times. Recite passages from the Qurʾan. Remember that one day you will stand before Him. Strive to act in the same righteous manner as the Prophet and his progeny, peace be upon them, in times of war and peace. Be the good example that Islam deserves. This is the religion that was built on illumination, reason, and good manners. Do not be haste in situations where caution is required. Do not undergo an action which will be the cause of your spiritual perdition. Advise each other. You will not find better advice than that which you offer each other. Unite, come together & overlook your differences. This entry was posted in Jafria and tagged Ayatollah Sayed Ali Al-Sistani, Ayatollah Sistani, Edict, Gand Ayatullah, Iraq, IS, ISIL, ISIS, Islamic State, Jihad, non-Muslims, Sanctity, Shia Muslims, Shia Volunteers, Sistani, Terrorists. Bookmark the permalink.